The concept of a “straw purchase” is a “doctrine” created by ATF and the courts, rather than a “crime” enacted by Congress. Indeed, as pointed out in our brief, in the immediate aftermath of the Newtown, Connecticut school shootings, Senators Leahy and Schumer introduced a bill (that was not enacted) to outlaw straw purchases. If straw purchases were already illegal, then there would have been no need for such a bill to be introduced. In this case, Petitioner Abramski, a former police officer who was eligible to own firearms, bought a handgun for his elderly uncle who was also eligible to own firearms. Both men passed a NICS background check, yet ATF claimed that Abramski lied on his Form 4473 when he claimed he was the “actual buyer” of the firearm. ATF argued that Abramski’s statement was “intended or likely to deceive” the Federal Firearms Licensee (“FFL”), even though he specifically asked two FFLs who both told him that he was following the law. Our brief pointed out that federal law never uses the term “actual buyer” — whatever that may mean. Rather, the statute refers to the “transferee,” the person physically present, standing in the gun store. Federal law only prohibits transferring a gun to someone who you know or have reason to believe is not eligible to possess it. Federal law does not, as ATF argues, prohibit an eligible person from buying a gun simply because he may later transfer it to another person eligible to possess it. ATF claims that the FFL is “required” by law to keep information about the “actual buyer,” but the law only requires a record of the “transferee.” The government has claimed that, unless the Supreme Court adopts its position, the law will be easily avoided. But, as our brief points out, is not up to ATF or the Supreme Court to write, or rewrite, the statute. Finally, our brief argues that ATF’s definition of a “straw purchase” is arbitrary and unworkable, since it exempts “gifts” bought with the transferee’s money, but not purchases made with the alleged “actual buyer’s” money. Our brief has already been attacked in an amicus curiae brief filed by the City of New York, which criticizes our brief for arguing to the Court that the straw purchase doctrine “encroaches on Congress’ legislative powers,” claiming that our brief “misrepresents that it is illegal for any person to buy a firearm on behalf of another person eligible to own it.” Predictably, the virulently anti-gun City of New York accepts the anti-gun position of ATF as deciding the issue of what is legal and what is not, disregarding the actual statutory language. Our brief on the merits was actually the second brief that we filed in the U.S. Supreme Court in this case. On July 25, 2013, we filed an amicus brief in support of the Supreme Court granting certiorari in this case — one of only two filed in support of granting Mr. Abramski’s petition. 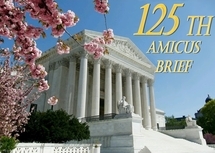 Our firm’s amicus curiae brief was filed on behalf of Congressman Steve Stockman, Former ATF Assistant Director Robert E. Sanders, Gun Owners Foundation, U.S. Justice Foundation, Gun Owners of America, Inc., Institute on the Constitution, Lincoln Institute for Research and Education, Abraham Lincoln Foundation, Conservative Legal Defense and Education Fund, DownsizeDC Foundation, Downsize DC.org, Policy Analysis Center, Oregon Firearms Federation, and Virginia Citizens Defense League.